Low Acidity Soup recipes, Soups to reduce acidity. When you are tired and droopy-eyed, the one thing that can comfort and rejuvenate you is a bowlful of soothing Soup! From thick soups to chunky and clear ones, this section has a wide range of appetizing soups prepared using easily-available alkaline ingredients like onions and potatoes. Indeed, this is a warm cuppa you will be glad to sip on! Clear soups are healthy and always taste good. No more running noses and sneezy wheezies with this Broccoli Broth. Ensure good health and immunity with this Vitamin C rich healthy clear soup made of vibrantly coloured and flavourful broccoli. The antioxidants contributed by broccoli and the other ingredients in this soup counteract the harmful cellular by products created during normal metabolism, making you fit and fresh. Quick Vegetable Broth provides lots of energy and nutrients while also being very soothing and pleasant, so much so that it sends a warm feeling through you, relaxing your nerves as you take every spoonful. It has potatoes and onions which are alkaline. This tasty, colourful and easy-to-cook soup is a low-cal treat brimming with the goodness of a basketful of vitamin A rich veggies. Another healthy and easy clear soup i have when down with a sore throat or on a cold day is the soothing quick vegetable soup. Also onion thyme soup is a nice healthy low fat soup with onion being alkaline and this recipe uses a vegetable stock which enhances the flavour. One cup of Mushrooms contain only 18 calories and is safe to be consumed by those who have high blood pressure. Mushrooms has a Glycemic Index of 15 which is very low and is diabetic friendly. So we give you some great options mushroom soup to diabetic mushroom soup. Sprouts contain enzymes that aid digestion and are alkaline in nature. Sprouting increases the availability of proteins. For example, on sprouting, the protein content of moong increases by 30%. On sprouting, the seed becomes a veritable nutrient factory with a greater concentration of Vitamin A, Vitamin C, Vitamin E, Vitamin K and B-complex. Enjoy this Indian style mixed sprouts soup. Eating small and frequent meals is a handy technique to keep acidity at bay. But then, you are always left wondering what to have in between the regular meals. This Mixed Sprouts and Mint Soup is an excellent choice. It is a nutritious soupy snack that can be enjoyed between meals, but it may also be served as an appetiser. It also does wonders to curb your acidity as sprouts are alkaline by nature. Mint is also known to subdue the stomach acids. Not too spicy, the Mixed Sprouts and Mint Soup is just perfect for your stomach condition. However avoid it if you are already experiencing flatulence. 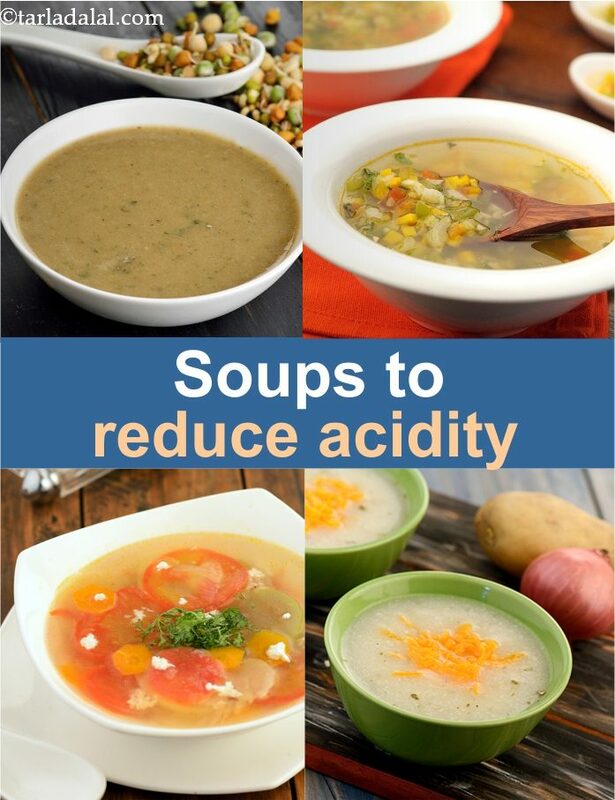 Enjoy our Low Acidity Soup recipes, Soups to reduce acidity and other acidity articles below. Simple to taste and easy to cook. There are no spices used to help you prevent acidity, however herbs add the necessary taste and flavour.